Virtually all philosophers agree that for a belief to be epistemically justified, it must satisfy certain conditions. Perhaps it must be supported by evidence. Or perhaps it must be reliably formed. Or perhaps there are some other 'good-making' features it must have. But does a belief's justification also require some sort of awareness of its good-making features? The answer to this question has been hotly contested in contemporary epistemology, creating a deepdivide among its practitioners. Internalists insist that such awareness is required for justification whereas externalists insist that it isn't. The first part of Michael Bergmann's book argues that internalism faces an inescapable dilemma: either it leads to vicious regress problems and, ultimately,radical skepticism, or it is entirely unmotivated. 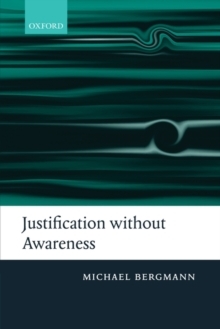 The second part of the book begins by developing the author's own externalist theory of justification, one imposing both a proper function and a no-defeater requirement. Bergmann concludes by demonstrating the failure of two prominent critiques of externalism, namely, that it is infected with epistemic circularity and that it cannot respond adequately to skepticism. Together, the two parts of the book provide a decisive refutation ofinternalism and a sustained defense of externalism. Moreover, they do so while placing a high priority on making the author's opponents feel that their positions and objections are understood.